Jockamo IPA | Abita Brewing Co.
Jockamo I.P.A. is a traditional India Pale Ale made with the best pale and light crystal malts that give the beer a copper color and malty flavor. This full-flavored beer is hopped and dry hopped liberally with Willamette and Columbus hops from the Pacific Northwest and has a 6.5% A.B.V. The spicy aroma of the hops contrasts nicely with the pleasant sweetness of the malts. 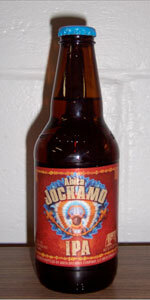 Jockamo has a flavor that entices and excites the palate. 12-oz. bottle into a pint glass at my house on Nov. 7, 2012 (purchased at World Market in La Mesa (San Diego, Calif.) for $1.99 on Nov. 7, 2012). Caramel amber with two fingers of frothy white head. Good foamy retention on the sides and good on the top as well. Smelled Cascade or Columbus hops (I’m usually pretty bad at knowing which hops are which). Also got sweet floral noted and a bit of dark fruit. Some caramel late and even some rye or iced tea notes. Tasted as a toned down version of the smell. Not as much Cascade hops and got more citrus than I thought I would. Still got that sweet dark fruit taste like the smell. Some pale notes as well. Light-to-medium body. Thin texture. Soft (below average) carbonation. Abrupt and slightly bitter finish. Finished this beer pretty fast, but I’m not sure what that means. Overall it was pretty good but I wasn’t completely sold on the feel/palate. A couple of the ratings could have gone either way. Malty, not hop driven. Drinks more like a thin syrup than a crisp, biting IPA. Drinkable, but not one I'd pick out of a lineup. I have been drinking Abita on trips to New Orleans for about a decade now. I always prefer to drink local if I can find a decent beer and Abita by far made the best local beer (which wasn't saying much). This beer really stood out from the rest. It was very nicely balanced between the hops, yeast and malt. Refreshing and flavorful. Being from California, it was nice to have access to a balanced IPA again. While I love the extreme IPA's that area all around, this is more of an every day IPA. Cloudy amber with an excellent thick head leaving nice lace. Nice IPA-ish aroma which seemed grassy hops-plus-lemon to me. Body was thin and a bit watery, though perhaps not untrue to IPA style. But I was let down by the taste in a beer claiming American IPA status. It simply didn't match the aroma. It was only faintly hoppy with a distant background bitterness. Other than that, not much going on. m-feels decent in the mouth, maybe a little thin but nice oil texture. d-this is for fans of not so hoppy ipa's and caramel malts. compared to the two ipa's ive had today(sierra nevada torpedo,bells two hearted ale), this one is probably going to be prefered by those who enjoy some hops but not a punch in the face. Poured cool into the Saison Dupont glass at 50degrees from a brown 12oz w/out freshness date. S - Very citrusy, hoppy and mildly grapefruit but sort of one dimensional w/out much malt in the aroma. M - A mildly bitter feel w/ plenty of sweetness and a skosh sharp in the finish w/ a grassy acidity w/ a slight fruit sweetness in the finish and light dry texture. T - A mildly acidic citrus hop flavor w/ a sweetness that grows as it becomes warmer w/ more of a woody spiced hoppiness and crystal malt flavor. As the beer warms it is slightly grassy w/ a sharper bite. The beer has a more nutty malt w/ restrained fruit also and sweetness. The warming boozy flavor is subtle w/ malt accepting a more prominent role and giving the taste a sort of balance when warmer. D - A very nice effort for Abita, a standout in their lineup for me. An easy drinking Ipa that is drinkable, thirst quenching but seems to lack any complexity. It has the basics - hoppy sweet ale flavors that makes an ale fan smile. This is mellow for those who prefer a less over the top Ipa. Abita Jockamo IPA is a crystal clear amber ale with a thin, off-white head that fades to a film and leaves excellent lacing. It has a nice, grassy hop aroma, with notes of juniper and allspice. It's medium bodied, super smooth and a little foamy. The finish is clean and dry. There's a tiny bit of sweetness and decent bitterness. It tastes like it smells: grass and juniper... and a hint of some kind of berry. Lemon zest is in the finish. This is actually pretty complex. It's quite engaging and could serve as a session ale. 12 oz bottle with best by date on neck. Appears a bright clear dark copper aroma. Cream colored head. Good head retention. Hop aroma is slightly spicy. Brady, biscuity malt aroma in there too. Taste is fairly balanced for an IPA. Caramel, toffee, earthy hops. Medium body, moderate carbonation. Drinks fairly smooth. Jockamo IPA from Abita Brewing Co.